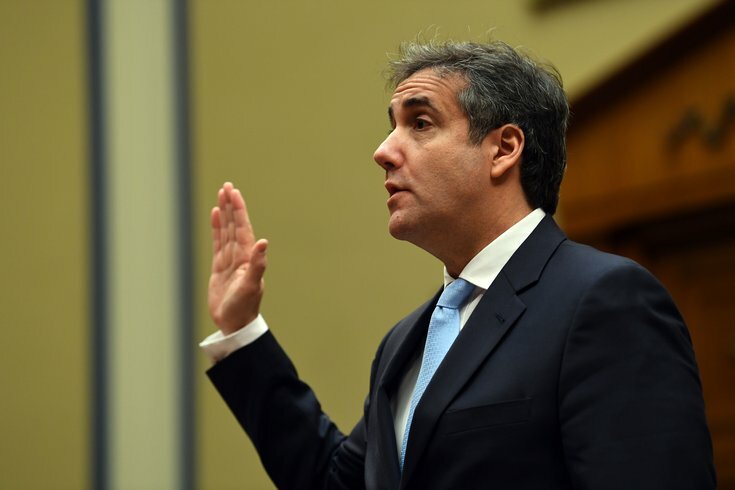 Michael Cohen, President Donald Trump's longtime personal attorney, testifies before the House Committee on Oversight and Reform on Feb. 27, 2019 in Washington. Cohen was sentenced to three years in prison for a series of federal crimes, including campaign finance violations and tax evasion. Michael Cohen is appearing in front of the House Oversight Committee on Wednesday to discuss his personal and professional dealings with President Donald Trump. During the prepared portion of his testimony Cohen called Trump a "racist," a "conman" and a "cheat." Cohen's testimony also provided more insight into Trump's contact with Russia during the 2016 election, his payments to Stormy Daniels, and the president's personal taxes. Cohen, Trump's former personal lawyer, was sentenced to three years in prison for a series of federal crimes, including campaign finance violations and tax evasion. Watch Cohen's testimony before the House live here. Here's what Twitter had to say. We'll be updating this as the hearing progresses. Gosar: "You're a pathological liar. You don't know truth from falsehood." Cohen: "Sir, I'm sorry, are you referring to me or the president?" The tricky part for Republicans working to position Cohen as a lying, lowlife, self-interested sleaze is that he was, for ten years, the chosen close confidant and enforcer for a president they consistently support. Hice: "This is the first time in history that we have someone convicted of lying to Congress here to testify in front of Congress. So, congrats on that." Rep. Jordan is fired up. "We are getting 30 mins from a guy who is going to prison." Rep. Gosar (R-AZ) calls Cohen a "pathological liar." Republicans' narrative remains that Cohen should not be believed and is a disgruntled employee who is mad he doesn't work at the WH. Hearing Jim Jordan, whose goal today is to defend Donald Trump at all costs, repeatedly tag Cohen over the term "blind loyalty," is ... weird. If the Republicans' chief objection today is that Michael Cohen is a convicted liar, I'm sure they won't object to subpoenaing Donald Trump Jr., Alan Weisselberg, and Roger Stone to tell their side of this story? Uh-oh! Things just got REAL! I'm pretty sure Donnie is throwing lamps in his Vietnam Hotel. So much about the past three years can be explained because people assumed Hillary Clinton could not lose and Donald Trump could not win. And everyone acted accordingly. Cohen is saying @realDonaldTrump knew about Wikileaks in advance. That is a big deal. Jim Jordan asking Cohen how he could work for someone he didn’t like for an extended period of time.